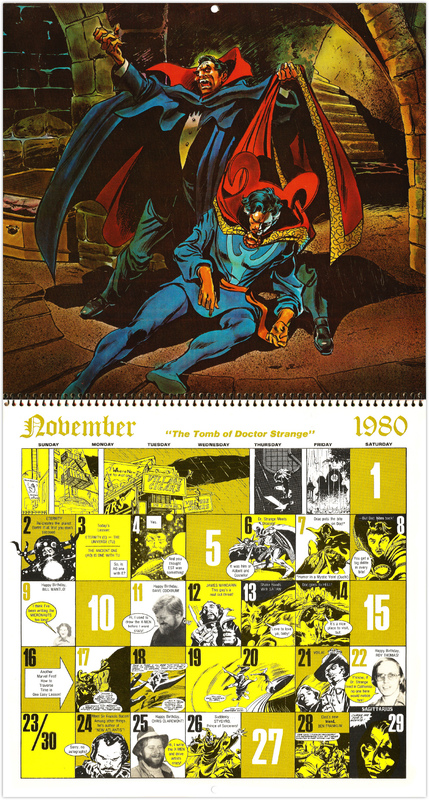 Marvel Comics Calendar 1980: The Occult World of Doctor Strange | 'TAIN'T THE MEAT… IT'S THE HUMANITY! 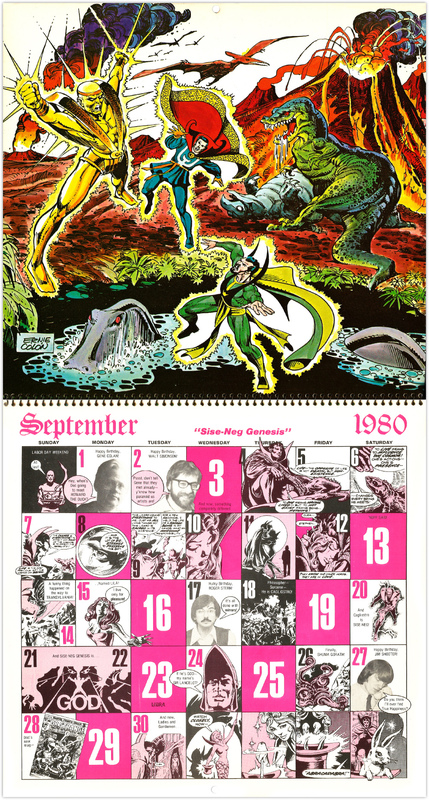 Time for another trip down into the Taint The Meat vault of comic book nostalgia. 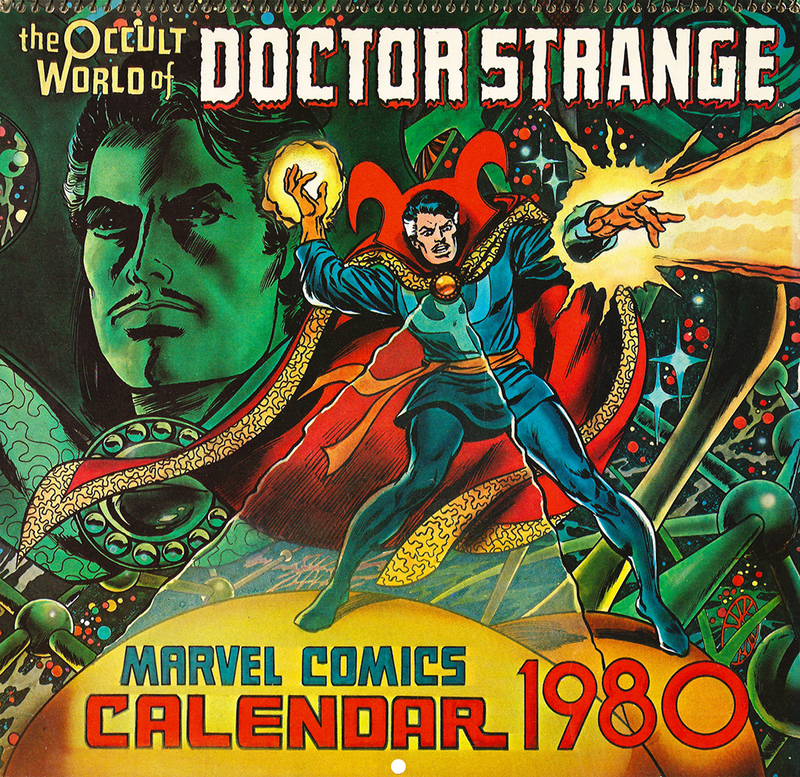 This time it’s the turn of the Marvel Comics Calendar 1980: The Occult World of Doctor Strange. May the Eternal Vishanti be praised! 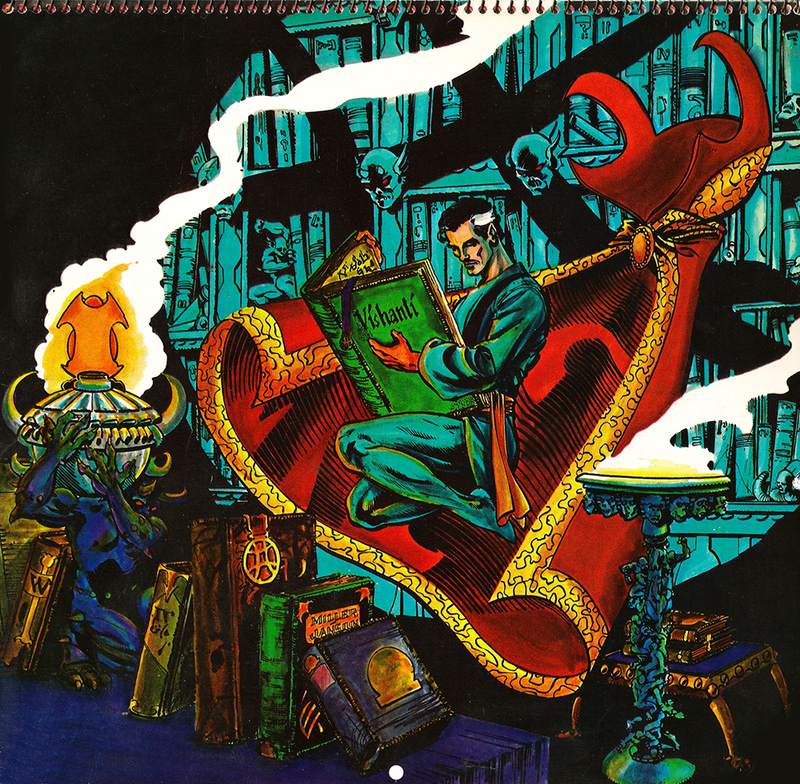 The back cover to Marvel Comics Calendar 1980: The Occult World of Doctor Strange. Artwork by Frank Miller and Klaus Janson. 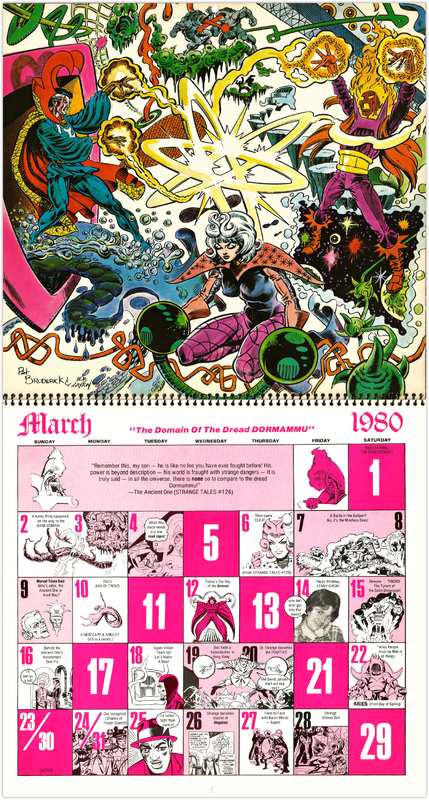 Between 1975 and 1981 Marvel Comics produced seven calendars featuring new artwork of some of their most popular superheroes, drawn by some of their most popular artists. 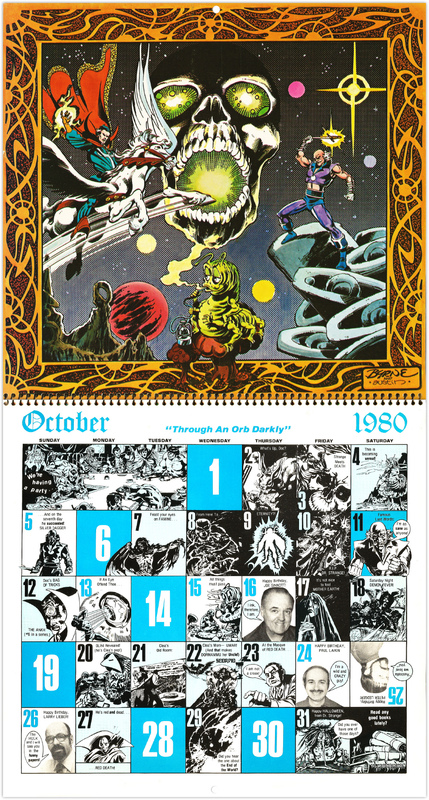 Each spiral bound calendar featured 12 new full-colour illustrations accompanied by that year’s calendar dates, as well as small reprinted pieces of line artwork and some truly groan-worthy gag captions. 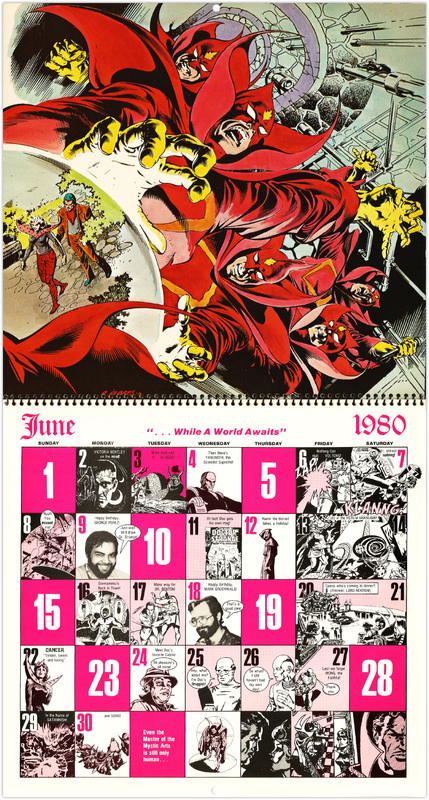 The calendar’s also printed black and white photos of Marvel Bullpen staffers along with their corresponding birthdays. 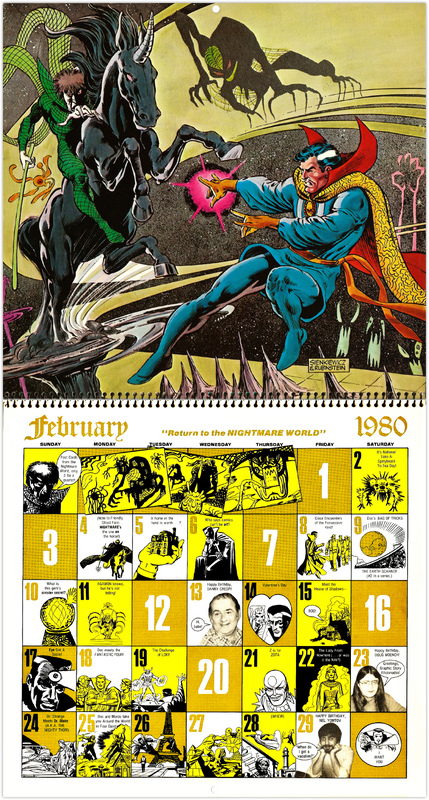 Although Marvel still release calendars, the modern versions don’t include those personal little touches that made the original seven so much fun — and also make them highly collectible. 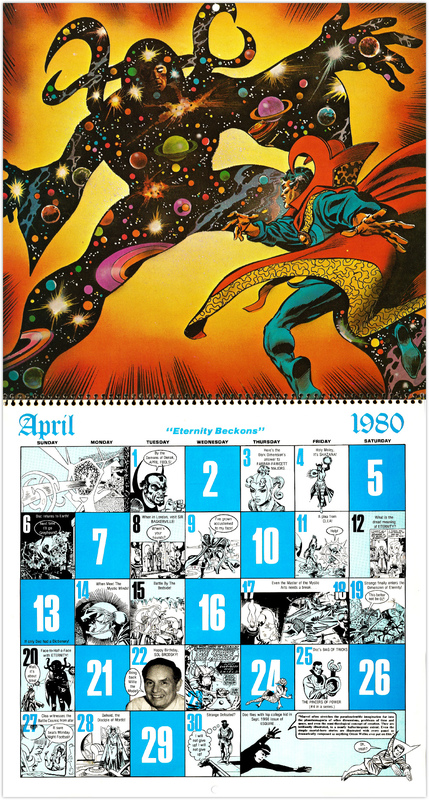 1980’s calendar featured Marvel’s very own Master of the Mystic Arts Doctor Strange, in 12 new illustrations by some of Marvel’s artistic heavy-hitters. 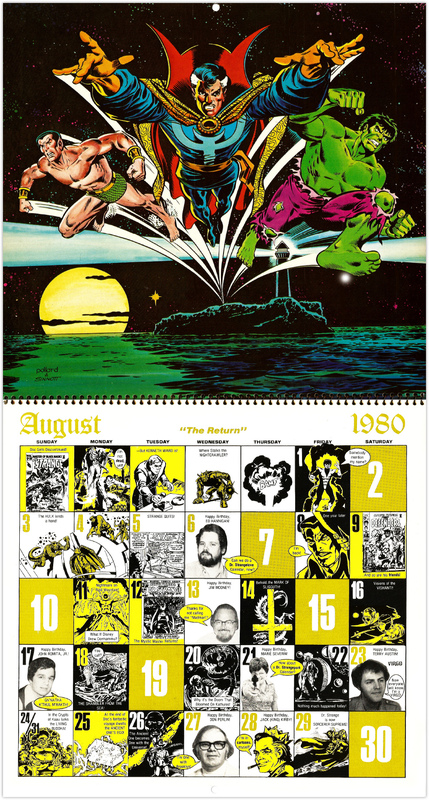 Artists Gene Colan, George Perez, Keith Pollard, John Byrne, Bill Sienkiewicz, Pat Broderick, Mike Zeck, Al Milgrom, Tom Sutton, Rudy Nebres and Ernie Chan contributed to the calendar — with the help of Joe Sinnott, Tom Palmer, Bob Wiacek, Josef Rubinstein, Bob Layton and Terry Austin, who inked their work. 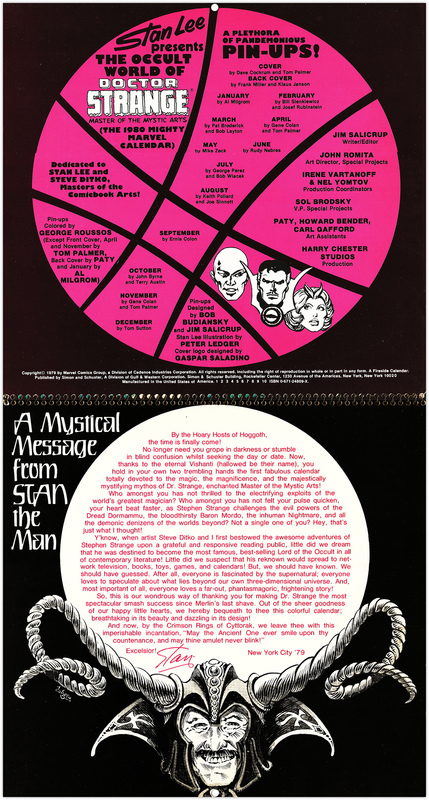 The front cover was pencilled by Dave Cockrum, while Frank Miller drew the back cover. 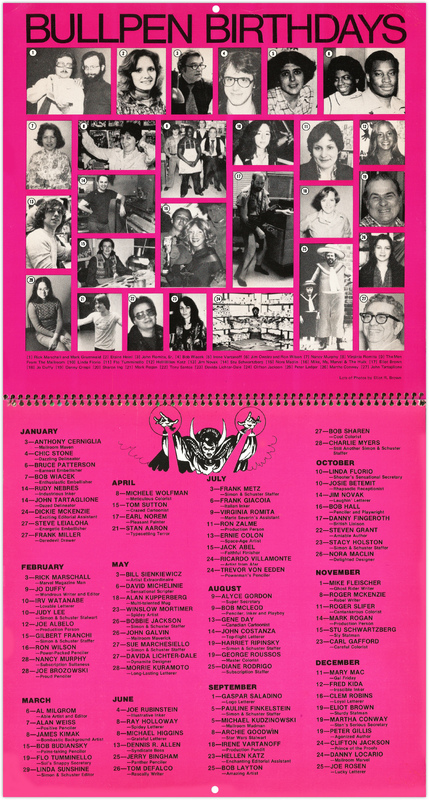 Also included was an introduction by Marvel legend Stan Lee as well as a full list of Bullpen birthdays, along with even more staff photos. 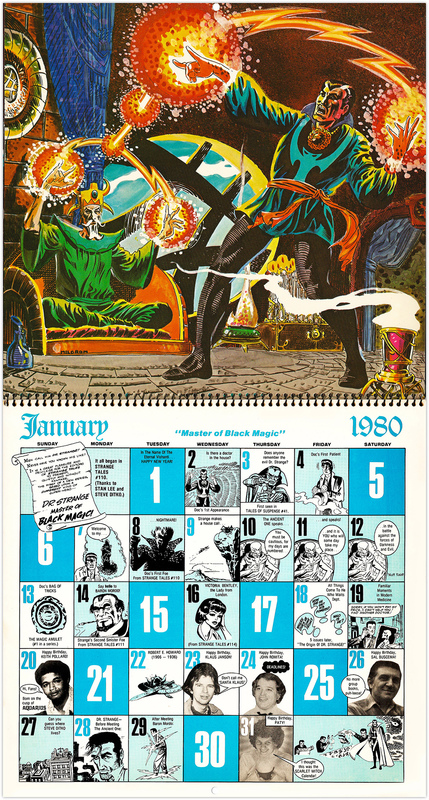 As a kid I was always a great fan of these calendars (I still am), and I couldn’t wait for a new one to come out. Apart from the excellent artwork I loved seeing what the Bullpen staff looked like, and knowing the dates of their birthdays. 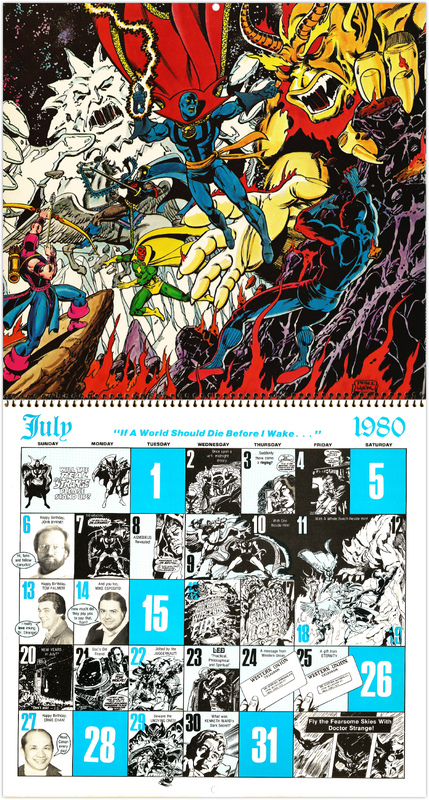 Under Lee’s stewardship Marvel had always maintained, and encouraged, a friendly relationship between its staff and its readers; Marvel treated its fans and its staff almost like members of a giant family, and these calendars always felt like a logical extension of that relationship. 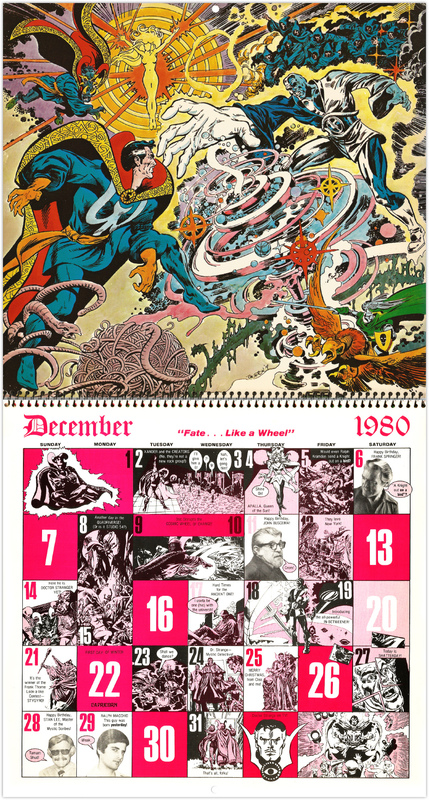 So here are all the pages from the Marvel Comics Calendar 1980: The Occult World of Doctor Strange, in all their mystic glory. 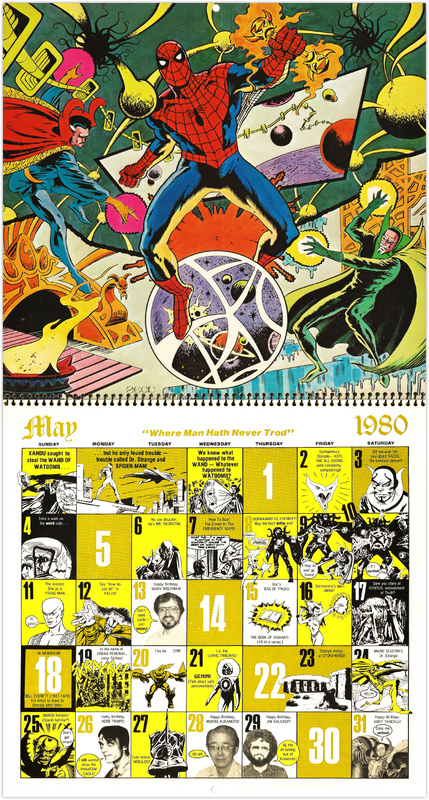 For those hungry for more I’ve already looked at three other Marvel Calendars — click here for the Mighty Marvel Calendar for 1975; The Mighty Marvel Bicentennial Calendar 1976 and the Marvel Comics 20th Anniversary Calendar 1981.